So spoke one elderly Jesuit to another after Mass on Christmas day. One of the men once laughingly told me, “I’m not ‘elderly.’ I prefer, ‘Veteran of the long campaign.’” He himself is a veteran of the Second World War. Among these old men, something was being born. The night before, Christmas Eve, I had the privilege and pleasure of celebrating an annual home Mass for some 50 people, families and friends. We had begun this holiday ritual about 25 years ago, when many of the group had little children, too small to easily take to church. Now, some of those children bring little ones. We sing carols. We listen again to Isaiah and Luke. The Eucharist is filled with prayer and song, laughter and quiet remembrance of those no longer with us, the peace and gratitude that fills our hearts as another year passes. John McCutcheon’s “Christmas in the Trenches” is always our Communion meditation song. Afterwards, we enjoy coffee and cookies; candy and conversation. Over a glass, we catch up on where we are in our lives. But for my brothers in Manresa Hall, the Jesuit infirmary at St. Joseph’s University in Philadelphia, life and prayer are different. These guys do not get to go out on Christmas Eve. As I had celebrated Mass the evening before, they were manning their posts in wheelchairs and hospital beds. As people listened to my homily, they were fulfilling the duties of their mission: praying for the church and the works of the Society of Jesus. They were praying for me and others as we led prayers on Christmas Eve. These priests and brothers, bearing the cross of infirmity and illness, turned the well-worn pages of their beat up copies of the Liturgy of the Hours as we marked again the birth of Jesus in our minds and hearts. 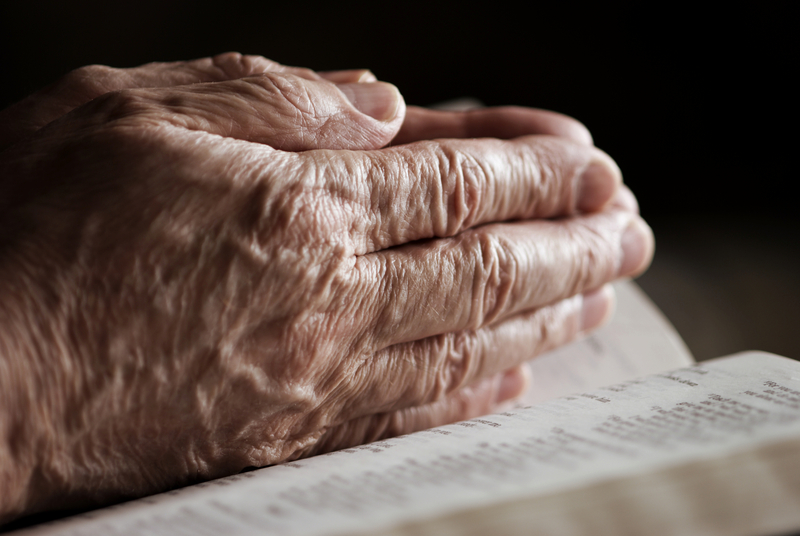 The force of prayer in their old age strengthens so many of us still able-bodied Jesuits. Christmas Mass is set for 11:30 a.m. We gather in the large sunroom of the infirmary. The tree is decorated and the crèche is before the altar. About half the gang can walk or wheel themselves to their customary spots. The gentle aides wheel in several of the guys. Most are awake. Some are sleeping. The men are dressed in old man chic: slippers; comfortable, baggy pants; plaid, warm, woolen shirts. Some are able to place stoles themselves. On others, the kind and smiling women in colorful smocks and hospital scrubs gently place the symbol of priesthood, smoothing the vestment’s fabric over the shoulders of those unable to do so themselves. Father Rector presides and preaches. Brother Jack, who each day lovingly serves the men in the infirmary, works the CD player and beautiful Christmas music fills the room. One seemingly frail, thin, former high school teacher proclaims the readings in a surprisingly loud and moving voice. The homily is a full 10 minutes, a wonderful reflection on the meaning and mission of Christmas. The Eucharist is slowly distributed. Each priest receives the consecrated body and blood he so often provided for others. Each brother receives the Lord he so faithfully has served with his life. These guys were once vibrant and vigorous Jesuit priests and brothers. In the corner, with a smile on his face, is a missionary who spent decades in India. Next to him a man who ran big and challenging city parishes. Quietly praying throughout the Mass is one of the best known Scripture scholars of the post-Vatican II era. Another, in a celebratory green and red Christmas sweatshirt, was a legendary hospital chaplain. And sitting up front is one who was both a provincial and university president. Most are elderly. One younger man in his early 60s is carrying the cross of a long-term battle with cancer and other physical ailments. He is confined to a wheelchair and hospital room while those of us who were novices with him are still running around. His courage and grace amaze me. “This is my body…. This is my blood.” The words of institution strike me with an almost physical force. Men like these taught me and formed me when I was a recalcitrant high school kid, befriended and guided me when I entered the order and mentored me through the years. They are my brothers. They are my family. If I am lucky, and do not die suddenly without warning, their lives now are my future. We are joined by the body and blood of Christ and our shared vows in the Company of Jesus, this least society started by St. Ignatius almost 500 years ago. The men in this room are my body and blood, and they gave their all, their bodies and blood, their sweat and their tears, their talents and treasure, to the service of faith and justice and reconciliation as Jesuits in the church. My chest is tight as I look in awe on these men who have borne Christ to so many. I am a bit stunned at how suddenly and unexpectedly grateful I feel to be part of their lineage and legacy. As the rector quietly and pointedly moves to each and every man as we all exchange the sign of peace, I feel a bond I cannot quite understand, nor articulate. Then, rough and raspy throats together voice the prayer Jesus taught us. Thy Kingdom Come. Here, at this Christmas Mass, the Reign of God is palpable. Brother Jack pushes the button at Communion time and “Hark the Herald Angels Sing” fills the room. I look around the room and realize I am in the presence of those who will soon be angels. After the final blessing and song, slowly, the procession to lunch begins. Suffering from severe dementia, one Jesuit turns to a man with whom he was ordained years ago. “I have a room here. You have a room here. We’re staying here.” He pauses and looks lovingly at his brother and quietly tells him, “Our next room will be in heaven.” There will be room in the Celestial Inn for these good servants of God. Richard G. Malloy, S.J., is university chaplain at The University of Scranton in Scranton, Pa., and the author of "Being on Fire: Top Ten Essentials of Catholic Faith" (Orbis Books). Jesuits who made a difference in my life. Fr. Ray York, Fr. John Browning, Fr. Ed Heavey, Fr. St George, Fr Timone, Fr. Aiden McMullen, and many more. It is popular to say Rest in Peace, but I feel that resting is the last thing those souls will do once freed from these dense forms we inhabit. I hope their energy flies through the heavens and universe feeling peace, knowing joy and being one with God. They sacrificed for the men of St Peter's Prep and the men and women of St Peter's College. Thank you, all! And Fr Shalloe, Fr. O'Connor, Fr. Ned Coughlin, Fr. Ed Dolan, Fr. Harry Hoffen, Fr. Auggie Meagher, All great men, for other men! How very beautiful, “Christmas Mass on the Edge of Heaven,” reading Fr. Mallory's account is like touching its very edge! All their goodness in word, and action, their love of God, meaningful Christian, Jesuit service, no one merely clinging to the edge, but sitting on it, waiting for the Gate to swing open. St, Paul once said, for those who love God, “all things” not (somethings) including the Cross in any of its many forms, like physical and mental disabilities, work “together” not (separately) unto “good.” God is the “maker of meaning.” Because we are made in the image of God, we too are makers of meaning.” What does this mean? It means that through Baptism, Holy Orders, Religious Profession, we become kin of God, we become with Jesus, suffering servants giving salvific meaning to suffering, as priestly, kingly, prophetic people, the later meaning not so much a foreseer of the future, (that too) but also a teacher, proclaiming the Kingdom of God here and now, as well as the Kingdom yet to come. What a job! This is precisely what the holy Jesuit priests and brothers now on sickbeds and wheel chairs have each been doing for decades! Well done, good and faithful servants! We appreciate you! Thank you, Fathers and Brothers! You win! One of my recent regrets is not having thanked, either by letter or viva voce, those Jesuits who taught me so well, and now sleep with kings and counselors. Dan, Stanley -- I'm sorry. I'll try to do better with those to whom I owe so much gratitude, who still walk the paths of the living.